Announce a winner for the Embroidered Sampler Magnet giveaway. Although I can not for the life of me figure out how people copy and paste the little box graphic from random.org, that is indeed how winners are chosen. That being said, the winner today is Number 16! How sweet - I adore that lazy daisy! thanks! Congratulations Lee and watch for an email from me in your inbox! 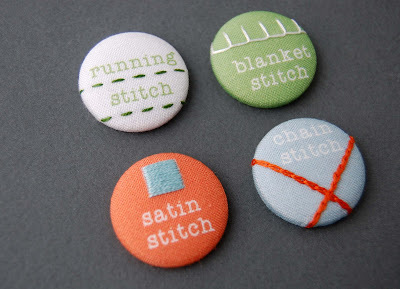 I'll be finishing up a little free printable this weekend and then a new week of Stitch-tember fun begins! Thank you!! I am so excited to have won these sweet magnets! I really do love that lazy daisy stitch... well and the French knot too and your blog! thanks again-enjoy that weather. Its rainy and cool here in Southeast Mi! I'll share how I get the Random.org widget thing, though it is complicated and I always wondered how everyone else did it too! Here is what I do: Once it has picked the number and displaying it, copy everything you can by highlighting the whole thing, then open a program like Photoshop and paste it onto a sheet, and then crop and re-size it as needed! Thank you Marci! The mystery is solved :) It was so frustrating that everyone else could do it but me and I was embarrassed to say I couldn't figure it out. Now I am glad I did!